My box of contributor copies for a Catholic Mom’s Prayer Companion has finally arrived north of the border! Release date is set for the end of this month. make you smile with occasions such as Houseplant Appreciation Day and National Popcorn Day. Each day begins with a brief quotation from scripture, saints, recent popes, or important spiritual writers. A personal reflection—written by contributors including Danielle Bean, Donna-Marie Cooper O’Boyle, Lisa Mladinich, Elizabeth Scalia, Carolyn Woo, Mark Hart and Jeff Young—focuses on some dimension of your spiritual, emotional, intellectual, or physical life. Each day also includes a brief prayer and a question or thought to ponder throughout the day. In just a few minutes of quiet you’ll find the boost you need from a friendly voice. Each month also has a special theme such as love, family fun, and slowing down. Start these reflections any time throughout the year and feel your days become more grace-filled and inspired. Other contributors include: Erin McCole Cupp, Barb Szyszkiewicz, Ann Frailey, Celeste Behe, Jeannie Ewing, Patrice Fagnant MacArthur, Jennifer Fitz, Pat Gohn, Margaret Realy, Leticia Velasquez, Karee Santos and many others! To order the book from Ave Marie Press, go here to this link. Presenters include keynote speaker Margaret Rose Realy (A CATHOLIC GARDENER’S SPIRITUAL ALMANAC), authors Gary Zimak (FROM FEAR TO FAITH), Karina Fabian (GREATER TREASURES), Lisa Mladinich (TRUE RADIANCE), Lisa Hendey (THE GRACE OF YES), Ellen Gable (STEALING JENNY) and many others. The conference will give authors an opportunity to meet personally with publishing professionals and pitch their writing projects. 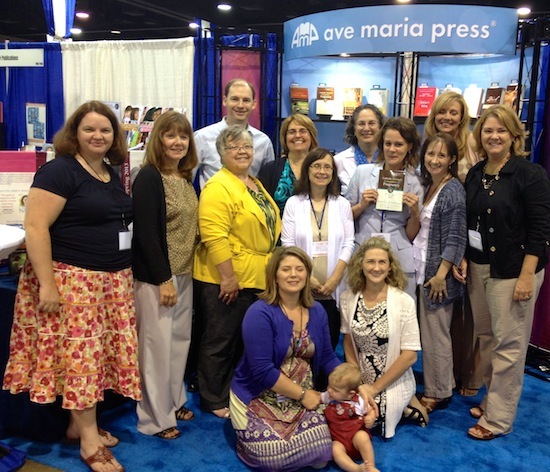 Some participating publishers are Ignatius Press, Ave Maria Press, and Servant Books. 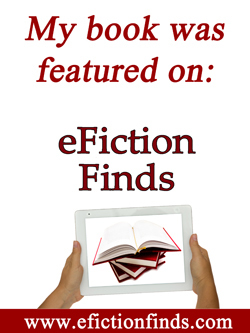 In addition, attendees have the opportunity to sign up for a fiction critique workshop with award-wining short fiction writer Arthur Powers (A HERO FOR THE PEOPLE), a non-fiction critique group with Nancy Ward (joyalive.net) and attend writing workshops with novelists John Desjarlais (SPECTER) and Michelle Buckman (RACHEL’S CONTRITION). Michelle Buckman will also be offering one-on-one critique sessions. Information for all these events can be found on the conference website. Registration costs $80 and $45 for students. CWG Members receive a 10% discount. There’s also a discounted registration combined with a CWG membership. To register or for more information, go to www.catholicwritersconference.com. Lisa Hendey, author of “Book of Saints for Catholic Moms” and “Handbook for Catholic Moms,” has written a wonderful new book, entitled “The Grace of Yes.” Today, for its launch, she has asked people to share how we say “Yes” to God in our everyday lives. I’m linking up with other bloggers over at Catholic Mom. On June 26th, 1986, I was rushed into surgery to remove a tiny baby from my right fallopian tube. This, after already miscarrying his or her twin from my womb. I woke up in the hospital with the knowledge that I had conceived twins…and I would be leaving the hospital with neither in my arms. Thankfully, a year later, after nearly nine months of morning sickness, I gave birth to a healthy baby boy and, two years after that, a strapping nine pound son. This was followed by two miscarriages and these losses had me questioning whether we should continue to be open to life. Despite the losses and difficulties, our third son was born in 1992. Even after my tumultuous history, my husband and I decided to be open and, not long after, became pregnant. A short while later, I found myself fighting for my life. In the ambulance, as I drifted in and out of consciousness, I didn’t have much time for retrospective thoughts, except “Please God, I can’t die. I don’t want my little boys growing up without a mom.” I was bleeding internally, the complications of ectopic pregnancy surgery two weeks previous, and quickly becoming weaker and weaker. Waking up later in the recovery room, I was thankful to be alive. However, as the months went by, I began to regain my strength. We continued using NFP in the most conservative way, often adding one or two days to the rules for extra security. A year later, with heaviness in my heart, I thought of the future and the fact that we would not have anymore children. I wondered whether God was calling us to actively seek another pregnancy. My husband and I discussed it, then brought our concern to our spiritual director, explaining that the doctor had “ordered” us not to have more children. “James and Ellie,” he said, “that is a decision to be made between the two of you and God.” He encouraged us to pray about it and he further recommended that we talk to a faithful Catholic doctor. We knew of a Catholic physician through a neighboring homeschooling community. Her response after reviewing my file was that we could try for more children, but that I would need to be monitored carefully in the first several weeks to confirm that it wasn’t another ectopic pregnancy. For the next several months, we prayed together. We deeply desired another child, but we did not want to be careless or irresponsible. After much prayer and discernment, and weighing all the risks, we decided to say “Yes” to God and actively seek another pregnancy. Ten cycles later, we were still not pregnant. We felt at peace with our decision to seek another pregnancy and, although disappointed, we trusted that God knew what He was doing. Eventually, we stopped charting. Another eight cycles went by with no pregnancy and I began to sell off most of my baby furniture. A few weeks later, it dawned on me that I hadn’t had a period in six weeks. The next morning, I took my temperature and it was 98.9. After 18 months of saying no to us, God was saying “Yes” and blessing us with another eternal soul. I was thrilled that another new life, the fruit of our love, had begun, and would be sheltered lovingly in my womb. Our fourth son was born healthy, at nearly ten pounds. The pro-life Catholic doctor who delivered him by C-section told me that we could try for another baby someday, but that the pregnancy would again have to be monitored. After another miscarriage, three years later, our youngest son was born. Saying “Yes” to motherhood meant enduring four miscarriages and three ectopic pregnancies and, with those, the physical and emotional suffering. But saying “Yes” to motherhood has also brought overwhelming joy with the births of our five sons, continued graces and the consoling knowledge that our seven unborn children will greet me one day in heaven. When we were a young married couple, I naively thought having children would be “easy.” I had no idea of the sufferings I would endure, but equally, I could not imagine the kind of joy being a mother could bring. Although we could have used NFP to limit our family size to three sons, we chose to listen to our hearts, to answer God’s calling, and to say “Yes” to more children. When I consider that our two youngest sons might possibly not be here today, my heart becomes heavy. Both are unique young men who have already given so much to our family and to society. Despite the difficulties, I am grateful that I said “Yes” to motherhood, continue to say “Yes,” and feel tremendously blessed to be the mother of five unique, talented and amazing human beings here on earth as well as those seven little souls waiting in heaven. 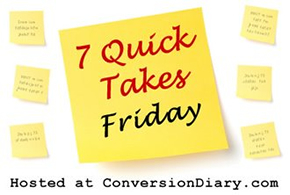 Please join me and other Catholic bloggers at Jen’s Conversion Diary for 7 Quick Takes Friday. I’m still “recuperating” from the Catholic Writers Conference/CNMC/Catholic Marketing Network Trade Show in Dallas last week. 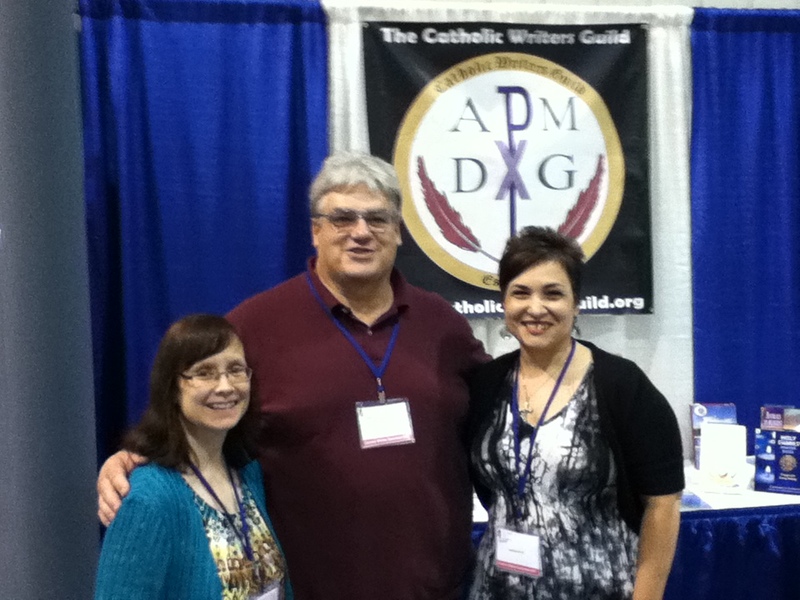 It was exhilarating and utterly amazing to meet and spend time with so many like-minded Catholics. I can’t wait to attend next year (despite the exhaustion I’m still feeling). However, before I get to the Quick Takes, I wanted to wish my second oldest son, Ben, a very Happy 23rd Birthday! Today will be an all photo Quick Takes with cool photos from some famous and yet-to-be famous Catholics! 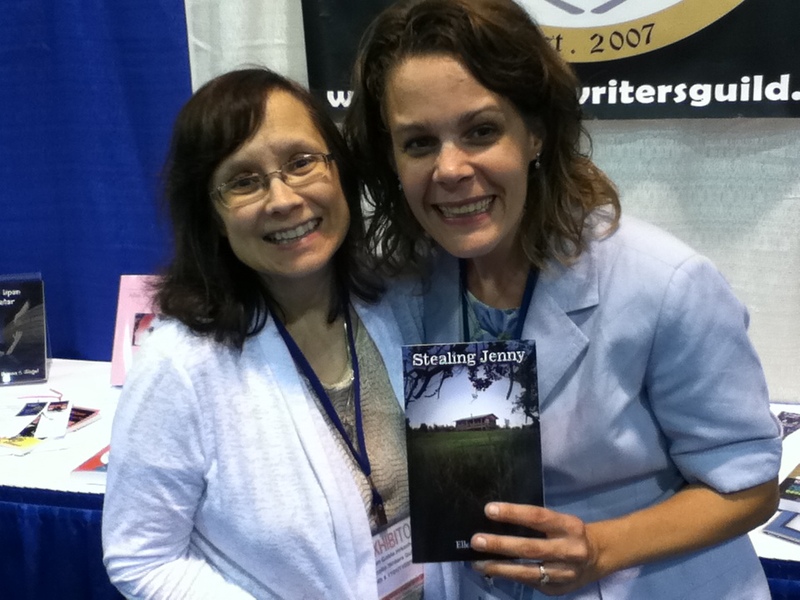 I’ve been wanting to meet Jennifer Fulwiler from Conversion Diary since I began reading her blog and participating in 7 Quick Takes last year. She’s one of the most entertaining bloggers I know. In the photo below, you’ll notice that we are both sitting. Something I didn’t know is that Jen is quite tall. Well, when I take photos with tall people, the only thing that usually shows up is my head. Hmmmm. Jen came up with the idea for the sitting photo. Thanks again, Jen! Okay, so Jeff is also tall, but at least some of my body got into this photo. He’s a great guy and he actually asked me for marketing advice. Cool. 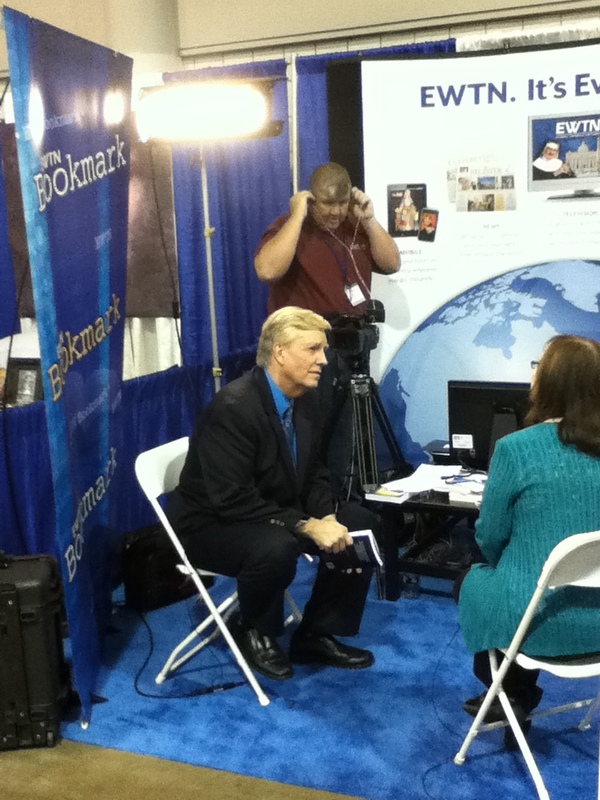 I had an opportunity to be interviewed by Doug Keck, host of EWTN’s Bookmark. He’s a great interviewer and a really nice guy. I know this isn’t an actual picture with Immaculee, but I did get to meet her and asked someone to take a photo. Unfortunately, the photo was accidentally deleted, so I figured that this was the next best thing. Immaculee is also very tall, beautiful and downright saintly. If you haven’t already read her books, check them out at this link. 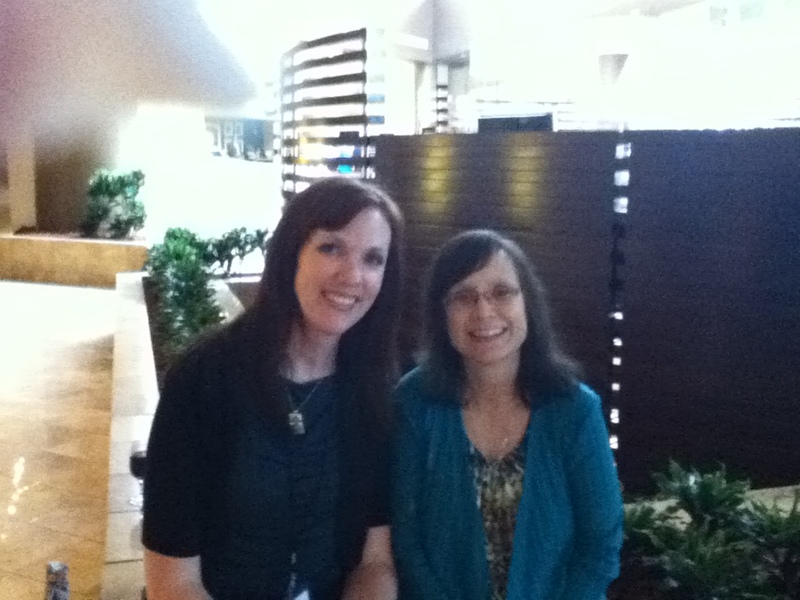 Sarah is one of my favorite authors and bloggers. She’s funny, enthusiastic and just a great person to be around. Val Bianco is the author of Sons of Cain, a Catholic thriller. He’s a big teddy bear of a guy! (If you haven’t read his book yet, I highly recommend it!) 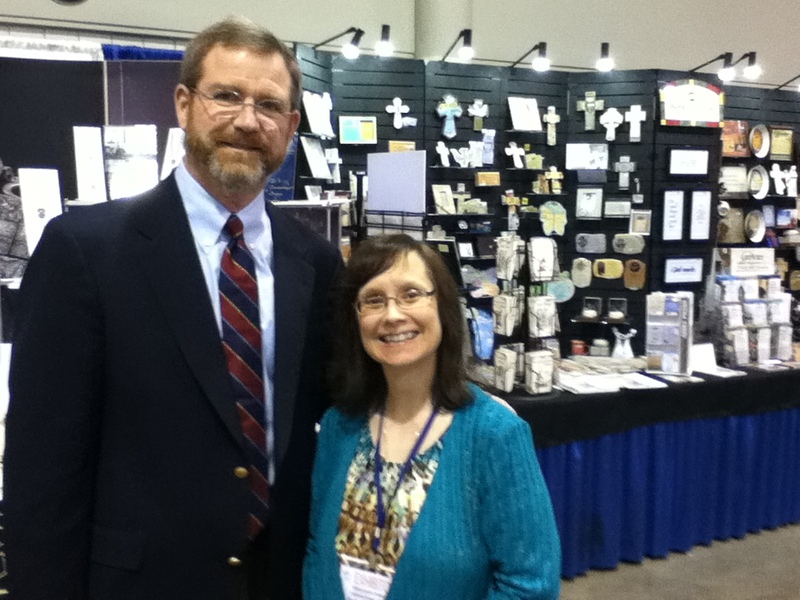 To his left is AnnMarie Creedon, author of Angela’s Song, Full Quiver’s soon-to-be-released Catholic novel. 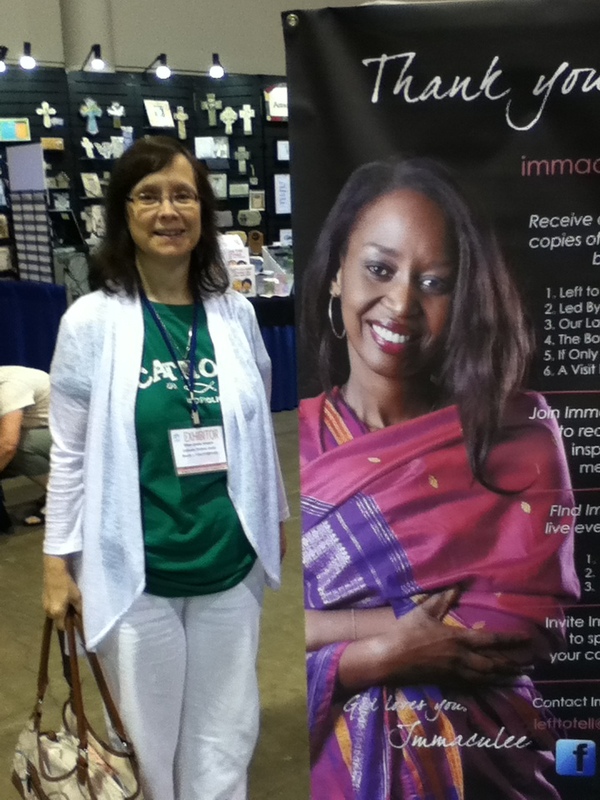 Lisa Hendey, founder of Catholic Mom, arranged for attending contributors to pose for a group photo. Lots of well-known Catholics in this photo! Which contributors can you recognize? Next week: Conference Highlights Part II. For more Quick Takes, check out Conversion Diary. Unless otherwise noted, photos and text copyright Ellen Gable Hrkach.